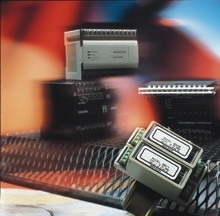 The DRP-8500 Series modules offer a low cost analog I/O solution for micro PLCs. The series is ideal for discrete automation applications requiring one or two analog I/O channels. All models in the series interface with the PLC high speed counter inputs or pulse outputs. Digital signal pulse-width is fixed at 50 µsec. They will accept a variety of analog inputs, such as thermocouple, RTD, strain gage, voltage, and current. Some DRP-8500 models can be connected to pulse outputs from a PLC, and will then provide an analog output. The DRP-8500 series modules have an isolated floating optocoupler transistor which provides DC isolation from the input, output and DC power. The output transistor is fully floating allowing either source or sink connection to the PLC. The DRP-8500 resolution is 12 bits. The DRP-8600 Series modules are designed to interface with the low-speed 24 Vdc logic inputs of a PLC for applications requiring additional analog inputs. The DRP-8600 modules output a square wave up 500 Hz with a 50-50 duty cycle, allowing the PLC to count the frequency producing better than 8- bit resolution, 1 part in 500. The DRP-8600 module has an isolated floating optocoupler transistor which provides DC isolation from the input, output and DC power. The output transistor is fully floating allowing either source or sink connection to the PLC. All modules are housed in a plastic case with a built-in U-foot for mounting on standard DIN rails. Connections are made to screw clamp terminals that accept wire sizes 22 AWG to 16 AWG. 참고: Each unit is supplied with an operator's manual.